AVCHD is a file-based format for the digital recording and playback of high-definition video. Developed jointly by Sony and Panasonic, the format was introduced for use in high definition consumer camcorders. AVCHD footage is usually saved in MTS or M2TS container format, which are widely used by Sony, Panasonic, JVC, Canon camcorders. The Apple Intermediate Codec (AIC) is a video codec designed by Apple, Inc to be an intermediate format in an HDV workflow. It features high performance and quality, being less processor intensive to work with than other editing formats. AIC does not use temporal compression, enabling every frame to be decoded immediately without decoding other frames. All Mac OS X software which makes use of the QuickTime codec libraries – primarily Final Cut Studio, Final Cut Express, and iMovie can use the Apple Intermediate Codec (AIC). How to convert AVCHD to AIC codec on Mac? If you have camera or camcorder that records AVCHD format, you may have the need to convert AVCHD to Apple Intermediate codec (AIC) for iMovie 11/09/08 or Final Cut Express 4 editing, because AIC codec is the best native codec for iMovie or FCE you can import AVCHD to iMovie 11/09/08 or Final Cut Express without rendering after you transcode AVCHD to Apple Intermediate codec. UFUSoft AVCHD Converter for Mac can be used as a Mac AVCHD to AIC Converter to deals with AVCHD footage and exports HD contents encoded in AIC for editing and playing back in iMovie or FCE on Mac. Below is the step-by-step guide for you to quickly convert AVCHD to Apple Intermediate Codec (*.mov) for editing in FCE, iMovie on Mac. Step 1. Download AVCHD (MTS/M2TS) files to Apple computer. Connect your AVCHD camcorder c to Apple computer via USB cable, find recodings from the camera. Then copy and transfer the files from camera to the Apple hard drive disk. Step 2. 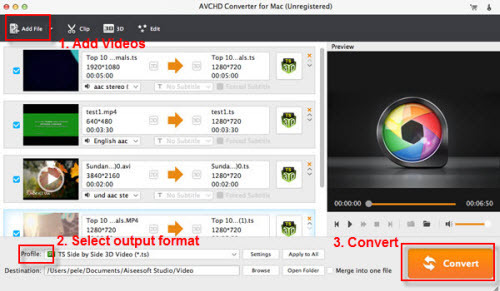 Load AVCHD videos to UFUSoft AVCHD Converter for Mac. Run UFUSoft AVCHD Converter for Mac as the perfect Mac AVCHD to iMovie Converter, and click the “Add” button to load the AVCHD (*.mts, *.m2ts) videos from Sony, Canon, Panasonic and JVC AVCHD Camcorders. Step 3.Choose MOV with Apple Intermediate Codec (AIC) for iMovie/FCE. 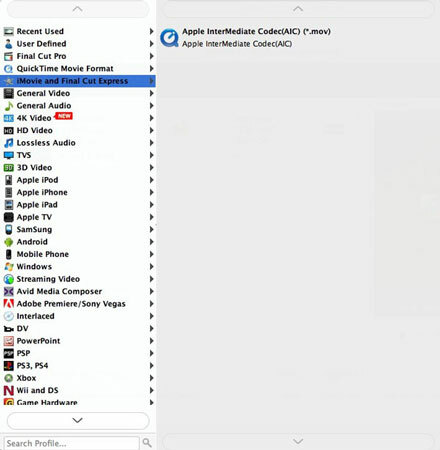 Click the “Format” option and navigate the mouse cursor to Quicktime Movie Format > Apple Intermediate Codec (AIC) (*.mov) as output format. The Mac AVCHD to MOV Converter will convert AVCHD to AIC MOV with high quality for iMovie or FCE. Step 4. Convert AVCHD videos to AIC MOV for iMovie or FCE. Click the convert button under the preview window, and the Mac AVCHD MTS/M2TS to AIC MOV Converter will start the conversion from AVCHD to Apple Intermediate Codec (AIC) MOV for Final Cut Express, iMovie. After the conversion, you can easily import Apple Intermediate Codec MOV to iMovie 11/09/08 or Final Cut Express 4 without rendering for editing. Tip 1: If you want to join or merge the AVCHD (*.mts, *.m2ts) files into one MTS or M2TS file, you can select all files and click Merge when load the files into the program. Tip 2: UFUSoft AVCHD Converter for Mac also allows to convert 1080p/1080i/720p AVCHD cameras/camcorders footages to editable HD video formats for non-linear editing software like Final Cut Pro X/7/6, Final Cut Studio, Avid, Adobe Premiere etc. The HD footage can be compressed to SD video clips for storage when you wanna save storage space.